In this case, don’t embrace your inner child. Did you know that 58% of kids’ cereals are eaten by adults over 18? Well, so what, right? Is that a bad thing? Yeah, actually it is. A Consumer Reports survey of 27 cereals marketed to children found that 11 of them contain as much sugar in one serving as a glazed Dunkin’ Donut. Most of us are aware that there’s basically nothing nutritionally redeeming about a donut, and we shun them indignantly. But, here we are consuming the same amount of sugary goop in a different form. Why? I think it’s about indulging the little kid in all of us. Whether it’s a longing for lost youth or a desire to enjoy formerly forbidden foods, these cereals somehow give us a happy, carefree feeling. In my case, my sugar intake was severely restricted as a child. My dad confiscated all of my Halloween candy after trick-or-treating, allowing me only one sweet and tossing the rest. I could not have any “fun” cereal for breakfast, and I was forced to eat spinach until I gagged at dinner. My dad had the right idea, but his technique backfired. 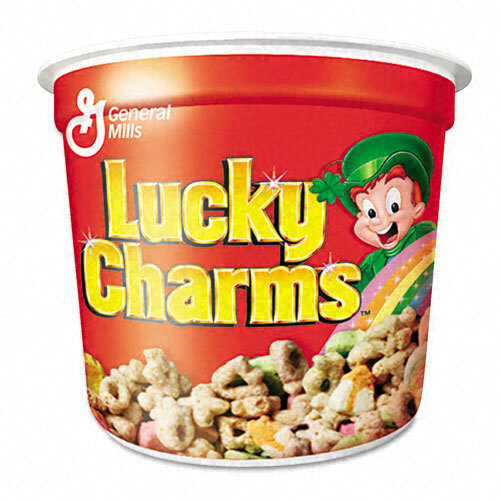 For instance, I was never allowed to eat Lucky Charms, and, as an adult, I stocked up on boxes and boxes of the faux marshmallow, crunchy stuff. It took me a long time to overcome the “food trauma” of those early days and learn to truly like high quality, healthy foods. Other kids didn’t go through that; instead they have fond memories of noshing on yummy-sweet cereals around the breakfast table, maybe flinging bits and bites across the table at their siblings. For them, eating that food now takes them to a happy place; it takes them out of the stress of raising kids, dealing with finances, maintaining a home and gives them some respite. It’s hard to begrudge that, but it’s not doing them any good in the long run. So, how do you enjoy your morning meal while treating your body right, too? When I’m craving a sweet and crunchy treat, I pour a cup of Kashi’s GO LEAN Crunch, in Honey Almond Flax and eat it dry. A cup’ll set you back 200 calories while delivering 500mg Omega-3, 9g protein, 8g fiber, 15g of whole grains, and it tastes fantastic! In fact, I sometimes have to watch myself to keep from eating the entire box. The only upside to that is that, while I would have consumed WAY too many calories, it would at least be good stuff for my bod. Entry filed under: about me, clean eating, diet recommendations, food review, news around the blogosphere, tips & techniques. More fun with PB&J	Happy Thanksgiving!